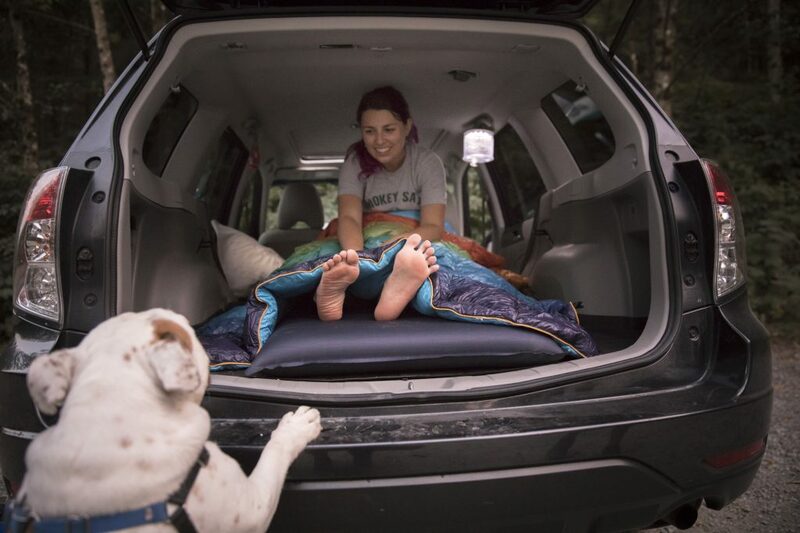 Not everyone can live the #VanLife, but almost anyone can sleep in a car. 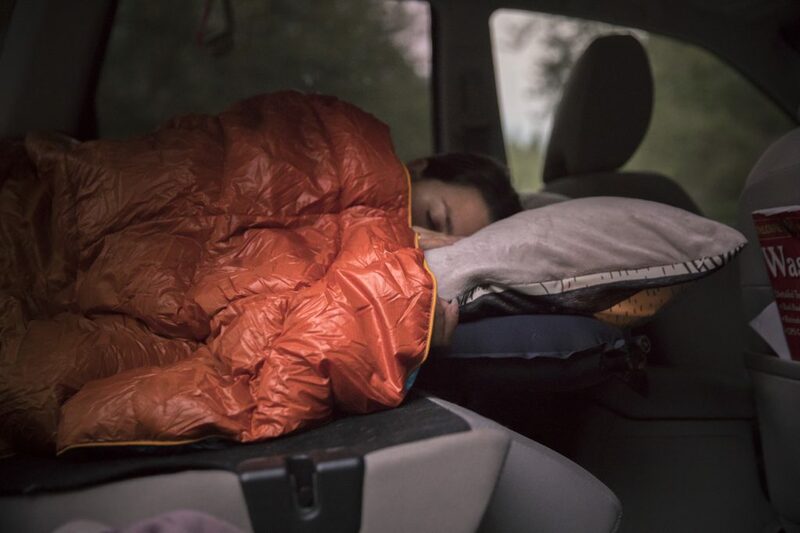 Whether you’re on an epic road trip or want the earliest start possible from the trailhead, your nights should still be comfortable. These tips and hacks will make your car so cozy, you might find yourself sleeping in the driveway at home. While car camping, make sure to follow Leave No Trace principles and common sense safety practices; never sleep in a vehicle with the engine running. The first question every car sleeper must answer: Where to park? With apps like AllStays and Hipcamp, you can figure out where you can stay legally and not be bothered. They offer a variety of free and paid locations to set up home for the night. Alternatively, U.S. Forest Service roads are open to overnight parking and camping. Just make sure you aren’t blocking the way for others, and display any required passes or permits as indicated. 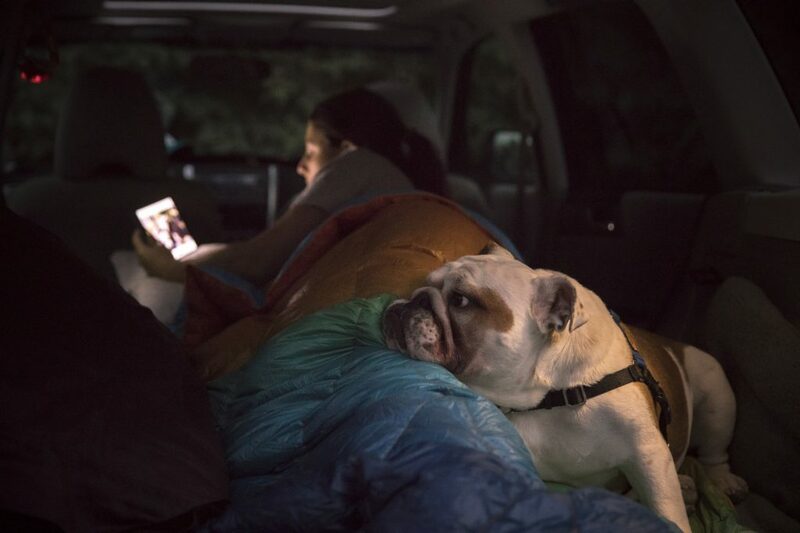 The #homeiswhereyouparkit hashtag came about for a reason—with a bit of prep, a night in the car can be as cozy as a night at home. After securing a spot that allows overnight parking and camping, set up camp in a flat, shaded spot. When it’s time to unload the vehicle, aim to blend in and avoid crowding other campers spending the night nearby. Check out our Camping Essentials Checklist for info about items (like chairs, a folding table and stove) that promote comfort. And, if it’s your first time camping, our Camping for Beginners article covers all the basics. Flat places are obviously preferred, but they’re not always available on windy Forest Service roads or in remote areas. If you find yourself at an angle, make sure to position the car so your head is above your feet. Sleeping with your head to the front of the car will also give you more elbow room generally, since most cars have wheel wells at the back that take up precious space. Comfort still lacking? Check out these camping hacks for everything from how to keep cold toes toasty to how to fashion your clothes into a makeshift pillow. The Ten Essentials are just as important on the road as on a trail. Keep them in your car at all times. Learn more here. Keeping electronics charged can be a challenge on the road. 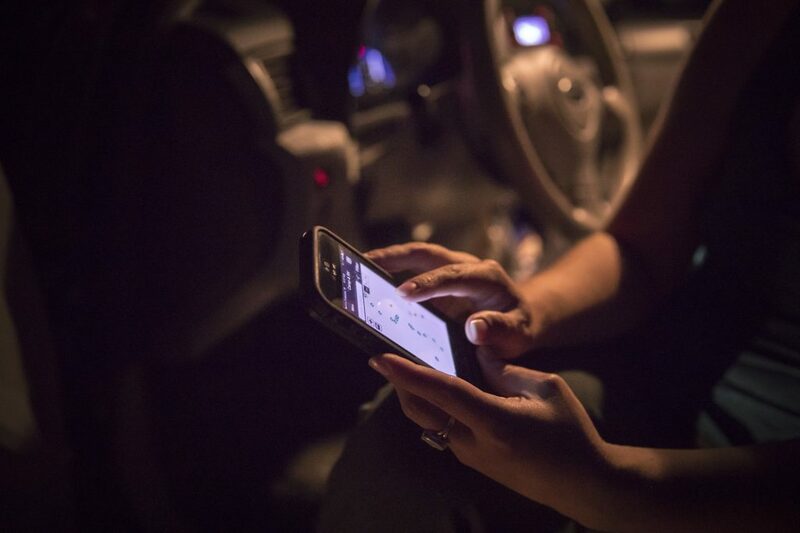 Though you can plug devices in while the car is on, overnight you’re out of luck. 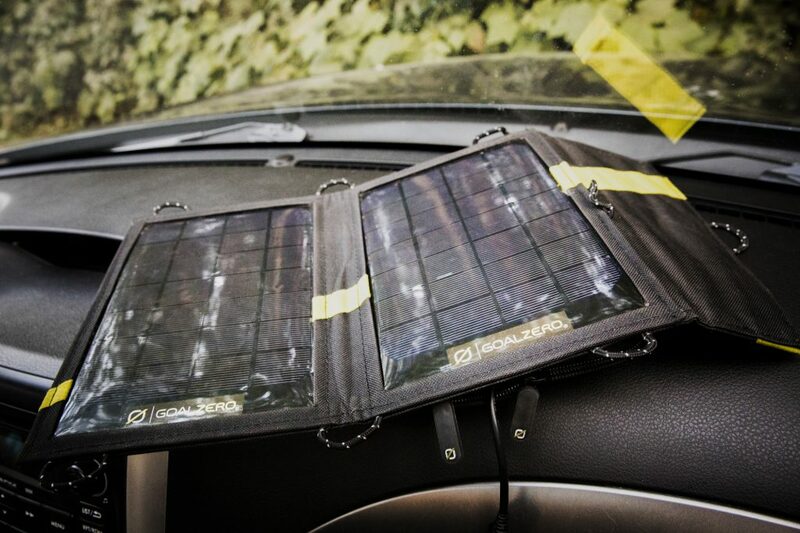 Use a solar panel on the dashboard or a portable power device to keep your phone, tablet, camera and any other battery-powered item alive and well for the duration of your trip. Not sure which one is right for you? Our experts are here to help. All it takes is a little time in the fresh air to work up an appetite when you’re car camping. Our Camp Kitchen Checklist can help you determine which utensils and food to bring on your adventure. 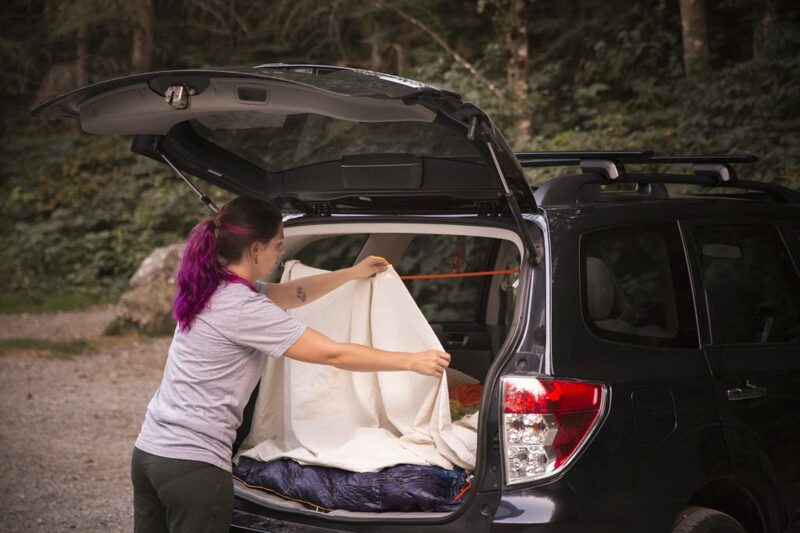 While car camping, plan to keep all of your food secured in your car—whether you’re trekking to the outhouse or curling up in your sleeping bag for the night. Consider packing a cooler to prevent perishables like meat, cheese, eggs and milk from spoiling (pro tip: pre-chill your cooler with ice or ice blocks to get the interior frosty before adding any food). For more tips on food handling while car camping, read our article on Food Storage and Handling for Campers and Backpackers. One of the best parts of sleeping in your car is that you aren’t carrying your bed on your back. So, you can splurge on heavier, cushier mats, pillows and blankets. Plush air mattresses can be almost as comfortable as your bed at home. You can go for a compact camping pillow or just bring a full-size pillow. Don’t forget that cars can get just as cold as tents at night, so pack an insulated blanket like a Rumpl or a temperature-rated sleeping bag. Not sure which sleeping bag or pad best meets your car camping needs? Our experts can help you determine how to choose a sleeping bag and sleeping pad for car camping. Unwind from a long day of driving or exploring with a movie on your smart device. Just make sure to download your content of choice before venturing out to potentially poor service areas for Wi-Fi-free entertainment. Getting comfy for the night doesn’t mean you’re ready to hit the sack right away. 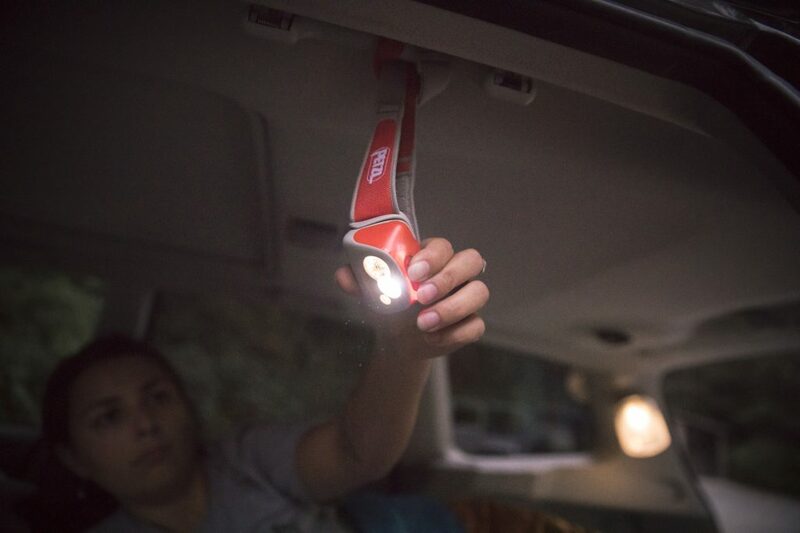 Hang lanterns or headlamps from car handles to illuminate your interior for reading, organizing or snuggling with your adventure pup. Other reasons to bring a headlamp on the road? It can help light the way when nature calls in the middle of the night, or if you want to do a bit of hiking at dawn or dusk. If you’re sleeping in your car, you probably won’t have access to sinks and showers. Keep your hygiene up with a fully stocked toiletry kit that is road-ready, including items that don’t need much water like no-rinse shampoo and hand sanitizer. Breathing all night in a vehicle will fog up windows and collect moisture where you don’t want it. Ventilation is key. 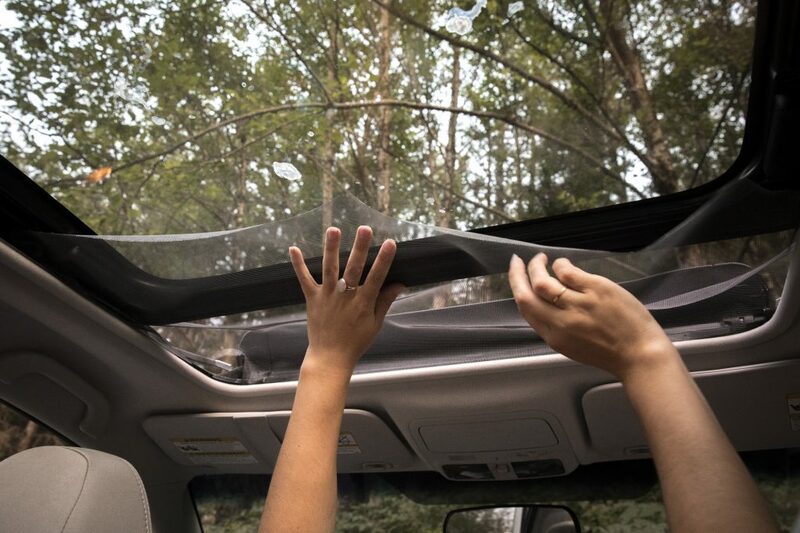 Open your sunroof or a window just wide enough so that an animal or person can’t get in. Get some cheap mesh and cut it 2–3 inches wider than the opening. Stuff the edges around the space to keep out the bugs and voilà, no moisture. 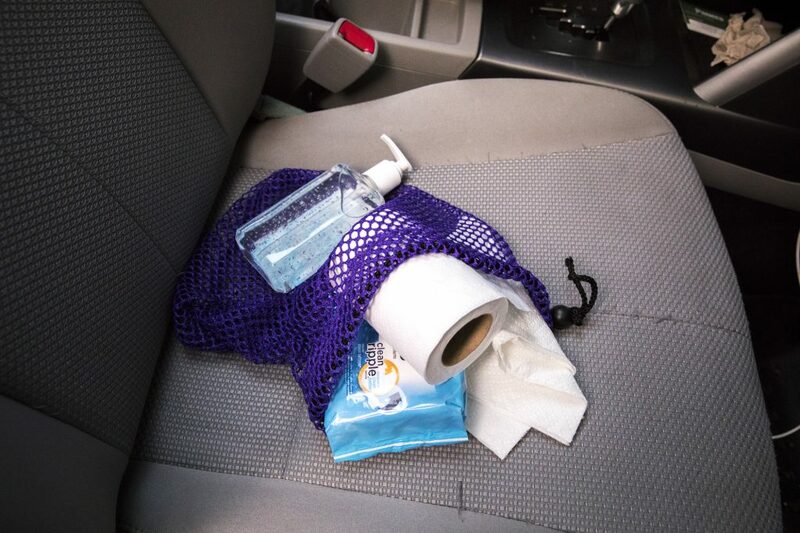 Alternately, place Damprid under the seats and collect little moisture-absorbing packets to stash with gear. Try to dry out wet clothes as much as possible before turning in for the night. As a just-in-case, keep a squeegee in your car to wipe down windows in the morning. Cars are great for getting around, but aren’t so good at blocking out light and sound. Create privacy (particularly important if you’re parked in a less-than-secluded place) and keep the morning sun out of your face by using cordage or bungees to hang curtains on all windows and behind the front seats for a nice, cozy bedroom-like feel. Bring earplugs to prevent any late arrivals, early risers or restless partners from disturbing your sleep. A warm shower after a long hike or bike ride feels amazing. 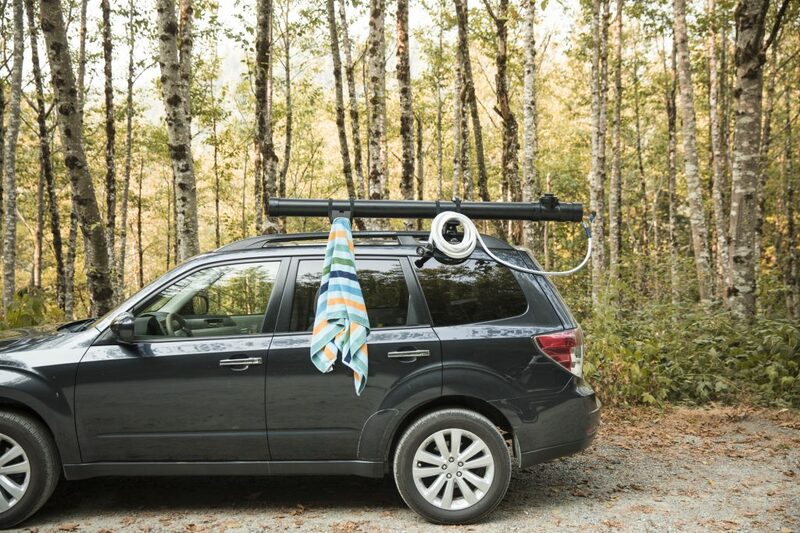 Take that feeling on the road with you by building your own camp shower. See our DIY project here. Looking for more camping advice? Our Expert Advice articles offer a wealth of information on topics ranging from How to Set Up a Tent to How to Build a Campfire. Who makes that rainbow sleeping bag?? Anyone know who makes the rainbow sleeping bag in the pictures?? I love this!! My boyfriend and I have been sleeping in our Toyota Prius for a couple years now, and we both fit in back! What a great article. Yesterday we it our name down for Ford Tourneo Connect that we plan to use for camper road trips when we are not wild camping. This is really useful advice. This site give all the information that ui needed, thanks that i found this! What make and model vehicle is displayed here? I’ve seen it before while doing research on this topic, but can’t remember which one it was. Very useful info by the way! Glad you liked the piece! It’s a Subaru Forester. Good article. Unfortunately, a sleeping bag or much of anything else works in a Ford Taurus. The only place comfortable enough to sleep is the front seat. Chevy Impala same thing. I’ve let my engines idle many,many times over the past 10 yrs. I didn’t have a choice when I got to areas that were very cold. After leaving my ex then losing another place I had to live in my vehicle. That’s where I’m at now. Finally realized, there really is only one solution to the cold & that is go to Florida. At least for the vehicle I’m in. The seats don’t fold down and it doesn’t have the ability to make a bed in the trunk like some cars. Some have a split from backseat to trunk. Anyway, good article. and I want to lie on a FLAT floor on my air mattress, I am less than 6 feet tall. of mid-size suvs or hatchbacks to sleep in? I found even a 5 F bag my feet got cold when outside temp was 24 F. A couple lessons learned: 1. Put on dry thick socks to keep warm, wear a beenie or hat to keep in heat, use a inflatable or foam mattress for comfort. Dont have feet contacting parts of car as conducts heat away. I also bought a thermal waterproof SOL bag to go over my sleeping bag for more warmth (adds 15 F more protection). Lastly, wear a sleeping mask since most lots are lit. If you are in bear country, DO NOT EVER keep food in your car. They can smell it even with all doors and windows shut, and are strong enough to rip a closed door off of it’s hinges. It’s a matter of life and death. Don’t do it.